LIMA (Reuters) - Peru's President Ollanta Humala named his sixth prime minister in three years on Tuesday in a surprise cabinet reshuffle that elevated two core members of his ruling party after an embarrassing political scandal. Humala, a former military officer whose popularity is at one of its lowest levels since assuming power in July of 2011, made outgoing labor minister Ana Jara his new prime minister in an official ceremony late on Tuesday. Jara is widely known as a close colleague of the president and the influential First Lady Nadine Heredia - the head of Humala's nationalist party - and has been one of the couple's most outspoken defenders since joining the cabinet in late 2011. Humala also swore in Fredy Otarola, the president of Congress and the secretary general of the ruling party, as the new labor minister. No other replacements were made. The cabinet change comes just a week ahead of Peru's independence day, when presidents traditionally reshuffle. It follows revelations that an adviser to outgoing prime minister Rene Cornejo allegedly used public funds to try to orchestrate a campaign to discredit a political opponent. Cornejo, whose five months as prime minister were dogged by accusations of impropriety by opposition lawmakers, has denied involvement in the alleged plan and any other wrongdoing. Humala, a one-time left-leaning radical who has continued orthodox economic policies in power, said on Monday that he would ask anyone implicated in the scandal to step down." I feel embarrassed by this situation," Humala was quoted as saying on state-run news website Andina. "We are not going to allow these types of practices in the government." Removing Cornejo from power might help Humala defuse outrage in Congress over the scandal as he prepares to send lawmakers a new package of economic reforms to boost sluggish economic growth. 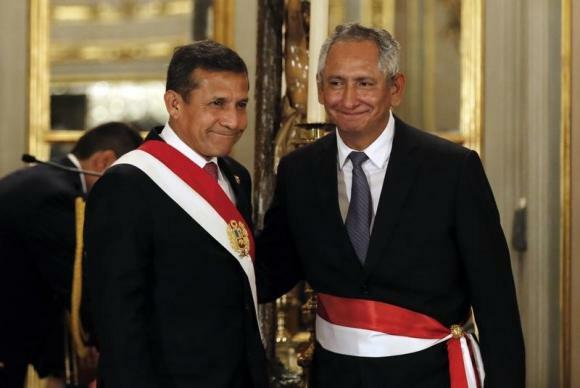 Cabinet shake-ups are not uncommon in Peru, a global minerals exporter, but Humala has made more changes in his first three years in office than two of his predecessors. Humala's approval rating in July was 25 percent, according to an Ipsos poll. Respondents cited crime and government corruption as their main reasons for disapproval.